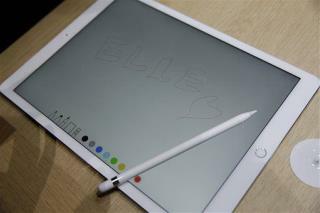 (Newser) – One of the Apple announcements getting a lot of attention is the company's $99 stylus—called the Apple Pencil—for the iPad Pro. As Apple watchers were quick to point out, Steve Jobs himself hated the idea. "Who wants a stylus?" he asked in 2007. "You have to get em', put em' away. You lose them. Yuck." And in 2010, he said, "If you see a stylus, they blew it." ABC rounds up some of the immediate, snarky reactions, like this. A Gizmodo blogger sees the development as a sign that Tim Cook and his team "feel confident enough in their own leadership to ignore the now very infamous words of Jobs." More importantly, it looks like a good product, one that's a "necessity if Apple wants to compete for the business of design and engineering professionals who need a stylus to do their jobs on a tablet." The problem is, Apple no longer has anyone with Steve Job's foresight or intelligence. It's called the Microsoft Surface. Just stealing ideas again.